Do I have to go to Heaven even if I don’t want to? I have been looking for this book since November 5, 1990. That was the day I completed reading the book: Chosen by God (By R.C. Sproul). Sproul introduced me in a whole new way to the depth and richness of the doctrine of the sovereignty of God—like water to a drowning man. From that day forward there has been a deep settled peace in my heart concerning life in general, my life in particular and my salvation specifically. I will forever be grateful (and indebted) to R.C. Sproul for this. That’s the good news. The bad news is that Sproul also introduced me to what Geisler would term “extreme Calvinism”. Most of what Sproul wrote I was comfortable with, but there was one alarming concept introduced to me which has troubled me ever since I first read Chosen by God back in 1990. What troubled me was the concept of “Limited Atonement”. Limited Atonement is the belief that Jesus didn’t really die for everyone—just those few special people who God decided for reasons we do not know to “elect”. The rest of the poor blokes out there could not be saved even if they wanted to. Actually, according to extreme Calvinism even those that are saved did not “want” to be saved (how can a dead man want anything?). Instead, God simply forces a few whom He elects to be saved and they’re dragged into Heaven kicking and screaming whether they want to go or not. Of course that is not how it is presented but for all practical purposes that is how it goes. That concept started me on a journey that has been troubling. Here I was, preaching a gospel that declared that God loved the whole world and that God had graciously endowed everyone with the ability to hear the Gospel and believe so that “whosoever” could be saved (John 3:16). Yet people who I admired and respected told me that this was not really the case (R.C. Sproul, John Piper, and Robert L. Reymond for example). How could that be? 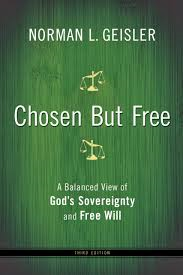 Enter Norman Geisler and his book “Chosen But Free.” Broadly, Geisler addresses extreme elements of both Arminianism and Calvinism weaving in sound reasoning and clear exposition from Holy Scripture. I consider Chosen But Free one of the most important books I’ve ever read and recommend it highly—for me it has been a game-breaker. Thank God for Norman Geisler and R. C. Sproul; in the end they have both helped me tremendously. Tags: Arminianism, Calvinism, Chosen but Free, Chosen by God, Freedom of Mankind, Limited Atonement, Norman Geisler, R. C. Sproul, Sovereignity of God. Bookmark the permalink. It is sad that this “Of course that is not how it is presented but for all practical purposes that is how it goes.” is your conclusion of “limited atonement”. This is not historical reformed thought on the issue. Nobody who doesn’t want Jesus gets him. And more to the point nobody who does is denied. Judging from just this blog post I would say that your problem is not with the atonement being limited, rather it is the incompatibility with “that” version of the will. The only way God’s atonement is NOT limited is if all are in heaven. Judging from your other posts you don’t believe this. Said simply: If anyone is in Hell then Jesus did NOT atone for them. God knows all things past present and future, thus He went to the cross knowing that His blood would not cover. This makes for yet another conundrum, leading many into open theism and the like. The most consistent, safest and grounded historical view is that of the WCF, and three forms of unity. Trying to communicate with someone who goes by the moniker of “anonymous” puts me in the mind of the atheist who felt an urge to be thankful but didn’t have anyone to be thankful too. But anyway, thanks for your interest. I usually do not respond to anonymous communication; but you also lived up to the “civil” part of you moniker and so I will at least remind you of the purpose of this particular blog entry—to mention a book worth reading. I stand by that. Thank you for the excellent book review, Pastor Kemp. You have named a few authors that I have read. Back in the 60’s in Toccoa Bible College, there were discussions in the dorm that that I had to choose between Arminianism and Calvinism. Being a new Christian i went to Dr. Irish, an old professor that I admired greatly, and asked him what should I choose. The wise old Christian said, “Miss White, there are about 380 verses that support Arminianism and the same for Calvinism. They are like two columns of scripture that seemingly run parallel, but somewhere in the heavens the columns meet and are held together by the Key Cornerstone, Jesus Christ. You don’t have to choose either one. Just keep your eye on Jesus and say you are a Christian. That is good enough.” With that answer, I have lived my life secure in my faith in Jesus Christ for nearly a half century. I must read Geisler’s, Chosen But Free.